We have recently received a message from Anne Maclean, secretary of the Association of Highland Clans and Societies. She forwarded an invitation from the 1745 Association which will be giving a guided tour of the Scottish National Portrait Gallery at 1 Queen Street, Edinburgh between 17.45 and 18.30 on Thursday December 8th 2016. 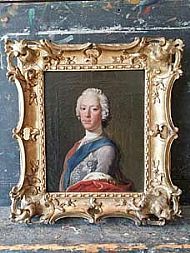 The Gallery contains the finest collection of Jacobite portraits in the world, including the recently acquired portrait of Prince Charles Edward Stuart painted by Allan Ramsay.